Rowan Quartz is 94% cotton and 6% wool. It's in the region if 270 GSM making it a slightly heavier than medium weight wrap. I was testing a 6 (base -1) with my toddler and five month old. Sjala is a Swedish company named for the Swedish word meaning 'to wrap'. They believe in secure attachments for children and parents, and also strive to be environmentally conscious in their production processes. There are many benefits to babywearing friends. Companionship, like-minded conversation, temp. trades, wrap walks... the list goes on. My dear friend Terri really went the extra mile though when, knowing I'd wanted to try (& review, naturally!) one, traded a wrap for Quartz so I could finally get my Sjala fix (thank you again Terri)! Having never even held a Sjala, it was the look of their wraps that first caught my eye. I absolutely love their nature-inspired designs and most particularly the lovely Rowan pattern. I have a bit of a thing for Rowan trees! You may have read my review of a Rowan design from another brand and remember my ramblings about the tree's long history in folklore and escoteric meaning. In Norse mythology, which is obviously of particular relevance given the Nordic origins of Sjala, it was the Rowan tree from which the first woman was created. Here in the British Isles, the Rowan tree has long been held to have protective qualities and used in various ways to keep people safe from harm. It's a perfect symbol to be associated with a baby wrap and Sjala's take on the theme is beautiful. Quartz combines silver grey with a delicate blush pink, and both threads shimmer as if they were silk. It screams class and luxury. Quartz has flipped hems and has no 'wrong' side. One side has pink leaves on a silver background and the other vice versa, with both sides being as beautiful as a ballerina. In hand, Quartz feels smooth and silky, with the design adding only a small amount of texture. It's a tight, dense weave and, although it's soft to the touch, it feels a little inflexible in hand. Quartz was only released a few months ago, and I don't know how much use this one has had. Suffice to say however that she needs a bit of breaking in before she'll be truly squish worthy and reach her full potential. When wrapping, the passes glide into place easily. The low wool content provides a small amount of grip but I found that it did slip a bit when wearing my toddler. It's not particularly forgiving of a sloppy wrap job either so you need to really pin those passes and hold tight to prevent slippage and slack when wrapping. Quartz has very little stretch or bounce which makes it beautifully strong and supportive. It has a little bit of cush but my picky shoulders found it a little 'diggy' after wearing it for a while. I've tested Quartz in a range of temperatures and varying humidities (ahh the fickle British summer!). The wrap is definitely better suited to cooler climes when it's snug tight weave adds warmth and insulation. I wouldn't recommend it for humid weather. Quartz is hand-wash only and unfortunately those beautiful pale colours really do show up the mud. 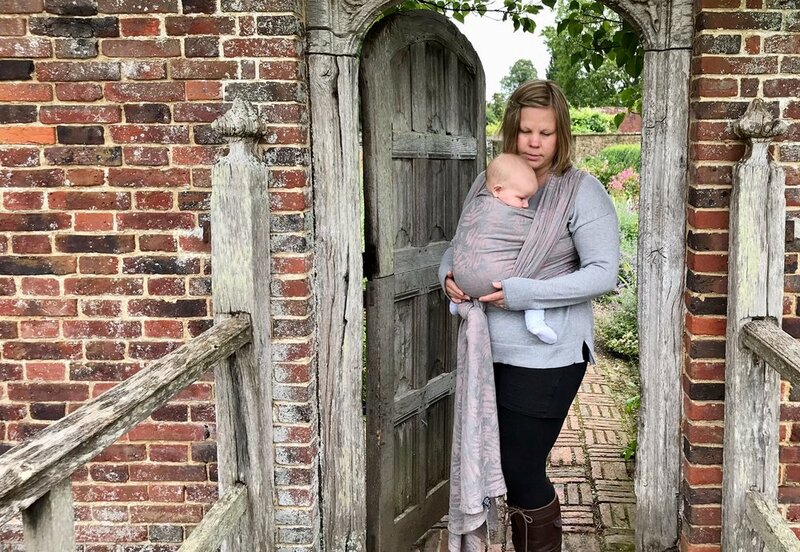 This wrap would look wonderful at a wedding or other special occasion, but it isn't really the kind of wrap you want your toddler pulling through the mud and trying to throw in the stream on a rainy afternoon (of course that totally never happened *coughs guiltily*!). Quartz is a Prima Ballerina of a wrap. It's a shimmering beauty but there's more to her than her pretty face. Solid and strong as the rock it's named after, yet thinner than it's weight would suggest, it will support toddlers and young babies alike as long as you don't skip her breaking-in warm-up. Oh, and like any ballerina, she's not really up for being dragged through the mud! You can find Sjala's in stock wraps on their website.